High concentrations of extracellular ATP (eATP) resulting from cell damage may be found during an ischemia/reperfusion (I/R) episode at the site of injury. eATP activates purinergic receptors in dendritic cells (DCs) and may inhibit inflammation. This immunosuppressive activity could be of interest in the field of I/R, which is an inflammatory condition involved in myocardial infarction, stroke, and solid organ transplantation. However, the specific purinergic receptor responsible for this effect remains to be identified. In this study, we report that eATP induced maturation of human monocyte-derived DCs. Additionally, eATP inhibited IL-12 production whereas IL-10 levels remained unchanged in activated DCs. These effects were prevented by the P2Y11R antagonist NF340. Interestingly, a 5-h hypoxia prevented the effects of eATP on cytokine production whereas a 1-h hypoxia did not affect the eATP-mediated decrease of IL-12 and IL-6. We showed a time-dependent downregulation of P2Y11R at both mRNA and protein levels that was prevented by knocking down hypoxia-inducible factor-1α. In this study, we showed an immunosuppressive role of P2Y11R in human DCs. Additionally, we demonstrated that the time-dependent downregulation of P2Y11R by hypoxia orientates DCs toward a proinflammatory phenotype that may be involved in post-I/R injuries as observed after organ transplantation. Extracellular ATP (eATP) is a member of the damage-associated molecular patterns (DAMPs) family (1) and, as such, is an important immune regulator. Low concentrations of eATP are locally secreted under physiological circumstances such as synaptic release, but higher concentrations may be released as a consequence of cell damage or cell death (2). eATP stimulates cells through the activation of purinergic receptors (P2Rs). These receptors are divided into two subfamilies: ATP-gated ion channel P2X receptors and G protein–coupled P2Y receptors. P2Rs were shown to play major roles in several immune cell functions such as neutrophil migration (3), NK chemotaxis (4), or inflammasome activation (5). Ischemia/reperfusion (I/R) is a major phenomenon involved in the pathophysiology of acute myocardial infarction, solid organ transplantation, stroke, circulatory arrest, and sleep apnea. During the I/R sequence, blood flow interruption initially generates ischemia-induced injuries. Reperfusion is associated with additional tissue damages, called lethal reperfusion injuries (6, 7). There is increasing evidence advocating the implication of innate immune cells, especially dendritic cells (DCs), in myocardial I/R injuries (8–10). DCs express a large array of DAMP receptors, particularly P2Rs that are crucial factors of the DAMP-mediated immune response (11, 12). It is well established that in response to danger signals such as pathogen-associated molecular patterns (LPS, bacterial DNA), T cell–derived signals (CD40L), proinflammatory cytokines, or molecules released from dying cells (ATP, heat shock protein, high-mobility group box 1), DCs endow the capacity to maturate and migrate to lymphoid organs where they stimulate T cells (13). Besides their ability to activate T cells, DCs have been shown to orchestrate both innate and adaptive immune responses in the presence of danger signals (14, 15). Some studies highlighted the important and intricate role of DCs in myocardial post-I/R injuries through the control of immune cell homeostasis (9, 16). The authors suggested that DCs might be either beneficial or deleterious to organ functions according to the signaling pathways involved. Most of signaling pathways involved in I/R are triggered by eATP and TLR2/4 agonists, such as high-mobility group box 1 or heat shock proteins 60 and 70 (7, 17). Interestingly, it was previously shown that eATP inhibited proinflammatory cytokine secretion through the activation of an unidentified P2R (18). Such a receptor may participate in the prevention of harmful inflammatory responses and might be of interest to modulate I/R-induced sterile inflammation. The roles of eATP and P2Rs on DC functions during an I/R sequence remain poorly studied. First, although previous experiments have shown some effects of eATP on DC maturation and modulation of cytokine production (19, 20), the P2Rs responsible for these effects remain to be clearly identified (18). Among all P2Rs, previous studies suggested that P2Y11R might be a likely candidate in the eATP-mediated DC activation (21). However, participation of other P2YRs or P2XRs was also proposed (19, 22). Second, the effects of I/R on purinergic signaling is still poorly explored in DCs, although this signaling pathway is known to be involved in such pathological conditions. A study reported that macrophage P2X7R participates in the Nlrp3 inflammasome activation during I/R (23). In this mechanistic study, we investigated the impact of hypoxia/reoxygenation (H/R) on eATP-mediated purinergic signaling. We report in the present study that human DC-associated P2Y11R is critical in the eATP-mediated maturation and shift in cytokine production. Furthermore, we demonstrate that hypoxia downregulates P2Y11R expression through hypoxia-inducible factor (HIF)-1α–dependent transcriptional regulation, leading to the loss of its immunosuppressive activity. Our observations support the idea that selective P2Y11R agonists could down-modulate the inflammatory response that occurs during I/R and could provide beneficial effects on organ function, especially in the field of organ transplantation and myocardial infarction. ATP, 2′(3′)-O-(4-benzoylbenzoyl)-ATP (BzATP), ADP, UTP, UDP, suramin, pyridoxalphosphate-6-azophenyl-2′,4′-disulfonic acid (PPADS), and 2′,3′-O-(2,4,6-trinitrophenyl)-ATP (TNP-ATP) salts and chemicals for the solutions were obtained from Sigma-Aldrich (Lyon, France). The P2Y11R antagonist NF340 and the P2X7R antagonist A438079 were purchased from Tocris Bioscience (Bristol, U.K.). Human PBMCs from healthy blood donors were purified by positive selection using anti-CD14–conjugated magnetic microbeads (Miltenyi Biotec, Paris, France). Briefly, >95% pure CD14+ cells were cultured at a concentration of 1.6 × 106 cells/ml in RPMI 1640 supplemented with 2 mM l-glutamine, 50 U/ml penicillin, 50 μg/ml streptomycin (Life Technologies, Saint Aubin, France), 25 ng/ml IL-4, and 333 IU/ml recombinant human GM-CSF (Miltenyi Biotec). On day 6, immature DCs were harvested, washed, and exposed to normoxia (control [CTL]) or H/R. At the onset of reoxygenation, DCs were cultured with or without eATP with or without LPS or an inflammatory mixture. I/R was simulated in vitro by oxygen and nutrient deprivation as described previously (19–21). Immature DCs were cultured in a hypoxic chamber (Invivo 200, Ruskinn Technology; 1% O2, 5% CO2, 94% N2) with PBS supplemented with CaCl2 and MgCl2 during 1 or 5 h of hypoxia. CTL DCs were cultured in a normoxic incubator (21% O2, 5% CO2) in culture medium for the same durations. After hypoxia, CTL and H/R DCs were centrifuged (420 × g; 5 min) and then replaced in fresh medium in a normoxic incubator with or without maturation factors. For quantitative PCR and Western blotting experiments, immature DCs were subjected to hypoxia only (HYP DCs). CD4+ T lymphocytes were isolated (>95% CD4+) from Ficoll peripheral blood leukocyte fraction via positive selection using human CD4 microbeads. Before DC–T cell coculture, DCs were cultured in presence of LPS or inflammatory mixture, with or without eATP with or without NF340. After 48 h, DCs were washed twice and then placed in 96-well plates with allogeneic CD4+ T cells at a ratio of 1:5. Cytokine secretion was measured at day 6. Both H/R and CTL DCs were washed with PBS and incubated with fluorophore-conjugated Abs for 30 min at 4°C. After an additional wash, samples were analyzed on a flow cytometer (FACSCanto, BD Biosciences). Abs for CD83-FITC (clone HB15e, IgG1), CD25-allophycocyanin (clone M-A251, IgG1), CD86-PE-Cy5 (clone 2331, IgG1κ), CCR7-PE (clone 150503, IgG2), and CCR5-allophycocyanin (clone 2D7, IgG2a) and isotype controls were purchased from Becton Dickinson. CXCR4-PE (clone 12G5, IgG2a) and isotype controls were obtained from R&D Systems. The number of gated events was at least 10,000. Cells were analyzed using a FACSCanto flow cytometer (BD Biosciences). Analysis was performed using FlowJo software (Tree Star). Reverse transcription and PCR experiments were done as previously described (24, 25). Briefly, total RNA was extracted from both nonhypoxic (CTL DCs) and hypoxic DCs (HYP DCs) using the RNeasy mini kit (Qiagen). RNA yield and purity were determined by NanoDrop (Thermo Fisher Scientific). Total RNA was reverse transcribed using the SuperScript II kit (Invitrogen). For nonquantitative PCR, specific primers for human P2X1–7 and P2Y1, 2, 4, 6, and 11–14 receptors were used. The efficacy of these primers was checked with corresponding hP2X/hP2Y receptor cDNA in pcDNA3.1 plasmids as previously detailed (24). Samples were kept for 1 min at 95°C then subjected to 40 cycles of amplification: 95°C (30 s), 66°C and 60°C for P2X and P2Y, respectively (30 s), 72°C (30 s), and 72°C (4 min). PCR products were separated on 1% agarose gels containing ethidium bromide and visualized by UV transillumination (Gel Doc; Bio-Rad, Marnes-la-Coquette, France). Quantitative PCR was performed using iTaq SYBR Green Supermix (Invitrogen). Thermocycler conditions included an initial holding at 95°C for 2 min; this was followed by a standardized PCR program: 95°C (15 s), 60°C (30 s), and 72°C (30 s) for 50 cycles, and 72°C (5 min). Data were quantitatively analyzed on the LightCycler 480 software (Roche), in the form of crossing points (Cp), employing the second derivative method. Relative quantification was done using the 2−ΔΔCp method. GAPDH was used as housekeeping gene and results were expressed as fold change in mRNA expression compared with control cells. CTL and HYP DCs were cultured in six-well plates during 1 or 5 h. Cells were then washed twice in PBS and lysed with a lysis buffer (50 mM Tris-HCl [pH 7.4], 150 mM NaCl, 1 mM MgCl2, 1 mM CaCl2) containing 1% Triton X-100 and protease inhibitors (Sigma-Aldrich). Samples were loaded (40 μg proteins), electrophoretically separated on 10% polyacrylamide gels, and then transferred onto nitrocellulose membranes. Detection of P2Y11R and HIF-1α proteins were performed using polyclonal rabbit anti-human P2Y11R (1:600, Alomone Labs, Jerusalem, Israel) and monoclonal mouse anti-human HIF-1α (1:600, BD Biosciences) primary Abs, respectively. Membranes were further incubated for 1 h at room temperature with a goat anti-rabbit (1:5000, Bio-Rad) and goat anti-mouse HRP-conjugated secondary Abs (1:5000, Bio-Rad), respectively. HSC-70 was used as a loading control and was immunodetected using mouse anti–HSC-70 (1:30,000, Santa Cruz Biotechnology, Nanterre, France) and goat anti-mouse HRP-conjugated secondary Abs (1:5000, Bio-Rad). Protein detection was performed using the ECL Plus kit (Pierce ECL Western blotting substrate, Fisher Scientific) and Kodak BioMax MS films (Sigma-Aldrich). Cell-free supernatants were collected and analyzed for cytokines content by ELISAs. Both CTL and H/R DCs were cultured for 48 h in the presence of LPS (10 ng/ml; Cayla-InvivoGen) or an inflammatory mixture (1 μg/ml PGE2, 10 ng/ml IL-6, 10 ng/ml IL-1β, 10 ng/ml TNF-α; PeproTech) with or without eATP (100 μM) or NF340 (10 μM) at the time of reoxygenation. Levels of IL-12p70 (IL-12), IL-10, IL-6, IL-4, and IFN-γ (eBioscience) were measured in culture or coculture supernatants. Samples for each condition were assayed in duplicate. Immature DCs were transfected with small interfering RNA (siRNA) directed against P2Y11 or HIF-1α (siHIF-1α) gene expression or scramble sequence not targeting any known gene as CTL (siCTL). For P2Y11R silencing, siRNA was designed from the human P2RY11 gene sequence (NM_002566). siRNA targeting P2RY11 was designed by the online tool OptiRNA provided by the University of Nebraska–Lincoln (http://optirna.unl.edu/) and synthesized by Eurogentec (Angers, France). The forward strand was 5′-CCUUGGAGCCCGCGCUCUCGGUU-3′, and the reverse strand was 3′-UUGGAACCUCGGGCGCGAGAGCC-5′. For HIF-1α silencing, siRNAs were obtained from Thermo Scientific. Cells were transfected with siRNA using Lipofectamine RNAi max (Invitrogen, Cergy-Pontoise, France) according to the manufacturer’s instructions. Hypoxic insults were performed 48 and 72 h after cell transfection with siRNA directed against P2Y11 and HIF-1α gene expressions, respectively. Changes in free internal calcium concentration [Ca2+] were monitored using the fluorescent FURA-2AM Ca2+ indicator (Life Technologies) by spectrofluorimetry. Briefly, DCs were incubated at 2 × 106 cells per well of a six-well plate in OptiMEM medium (Life Technologies) containing 5 μM FURA-2AM (Invitrogen) at 37°C for 45 min in the dark. Cells were then washed twice in physiologic saline solution (140 mM NaCl, 4 mM KCl, 1 mM MgCl2, 2 mM CaCl2, 11.1 mM d-glucose, and 10 mM HEPES [pH 7.4]) and cultured for 2 h in normoxic (CTL DCs) or hypoxic (HYP DCs) conditions. DCs (106 cells) were then resuspended in 2 ml physiologic saline solution. Measurements were performed on a spectrofluorimeter (Hitachi F-2500, Hitachi, Tokyo, Japan) under constant agitation at room temperature. Excitation wavelengths were 340 and 380 nm and emission wavelength was 510 nm. Immature DCs (5 × 105/well) were left unstressed or stressed by 5 h of hypoxia. Cells were then centrifuged and cultured in fresh medium for 8 min in the presence or absence of eATP (100 μM) with or without NF340 (10 μM). Cells were harvested, washed, lysed, and centrifuged. Supernatants and standards provided with the kit were assessed in duplicate. cAMP assays were performed using a cAMP direct immunoassay kit (R&D Systems) following the manufacturer’s instructions. The genomic nucleotide sequence (2000 bp upstream of the transcription start site to the start codon site; ENSG00000244165) was extracted from the Ensembl human database (http://www.ensembl.org). To locate putative hypoxia-responsive elements (HREs), P2RY11 sequence was analyzed using bioinformatics tools that included JASPAR (http://jaspar.genereg.net/) and MatInspector (http://www.genomatix.de/). Results are expressed as mean ± SEM. Statistical analyses were performed with the SigmaStat 3.0.1a software (Systat Software, San Jose, CA) using Mann–Whitney rank sum tests or a Student t test where appropriate. A p value <0.05 was considered statistically significant. Using increasing eATP concentrations, we analyzed the expression of both maturation (CD83, CD25, and CD86) and migration markers (CCR7 and CXCR4) in human monocyte-derived DCs. 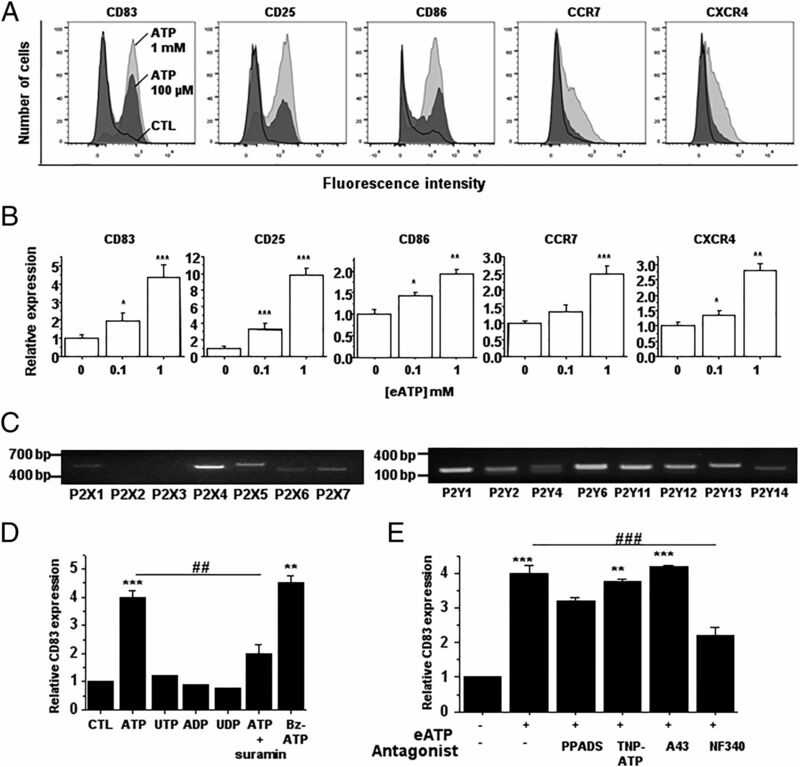 External application of ATP, from 0 to 1 mM, triggered the increase of CD83, CD25, CD86, CCR7, and CXCR4 markers in a dose-dependent manner (Fig. 1A, 1B). On the contrary, CCR5 expression was dose-dependently inhibited (Supplemental Fig. 1). As shown in Fig. 1C, human monocyte-derived DCs expressed mRNA for P2X1 and 4–7 and for all P2YRs (P2Y1, 2, 4, 6, and 11–14). To confirm that DC maturation upon eATP stimulation was mediated through the participation of a P2R, we used pharmacologic tools and took advantage of P2YR nucleotide preferences to analyze CD83 expression, as previously studied (19, 22). Whereas P2XRs are physiologically activated by eATP, P2YRs can be classified into ATP-preferring (P2Y11), ADP-preferring (P2Y1, 12, and 13), UTP-preferring (P2Y2 and P2Y4), UDP-preferring (P2Y6), and UDP sugar-recognizing P2YR (P2Y14). Despite its expression in DCs, P2Y14R was excluded because it is not activated by eATP. Thus, among all tested nucleotides (ATP, ADP, UTP, and UDP), ATP was the only one to induce effective increase in CD83 expression. Furthermore, as shown in Fig. 1D, the P2R antagonist suramin (100 μM) inhibited eATP-induced CD83 expression, demonstrating the involvement of an ATP-sensitive P2R. This result was confirmed by the use of BzATP (100 μM), a hydrolysis-resistant ATP analog, which induced a significant increase of CD83 expression. PPADS, a nonselective P2R antagonist, did not significantly affect the eATP-induced CD83 expression, suggesting a role for a PPADS-insensitive P2R (P2X4, P2Y2, 11, and 12; Fig. 1E) (26, 27). Because P2X4R and P2X7R have been shown to be involved in several functions of the immune system (28, 29), we analyzed their respective roles in DC maturation. Neither the P2X4R antagonist TNP-ATP (30 μM) nor the P2X7R antagonist A438079 (10 μM) prevented eATP-mediated CD83 upregulation. 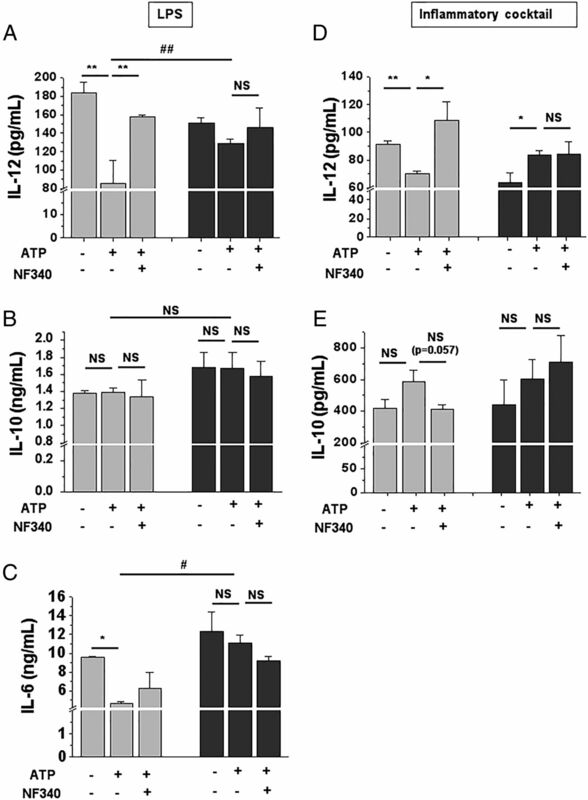 Only the use of NF340 (10 μM), a selective P2Y11R antagonist (30, 31), inhibited eATP-induced DC maturation (Fig. 1E, Supplemental Fig. 2), suggesting the involvement of the purinergic P2Y11 receptor in the eATP-mediated maturation of human DCs. P2Y11R is responsible for human DC eATP-dependent maturation. (A) Effect of eATP increasing concentrations on DC maturation and migration markers. Immature DCs were not stimulated (black lines), stimulated with 100 μM ATP (dark gray histograms), or stimulated with 1 mM ATP (light gray histograms). After 48 h of DC culture in these conditions, CD83, CD25, CD86, CCR7, and CXCR4 surface molecules were analyzed by flow cytometry. Shown is one representative experiment from one donor out of seven independent donors. 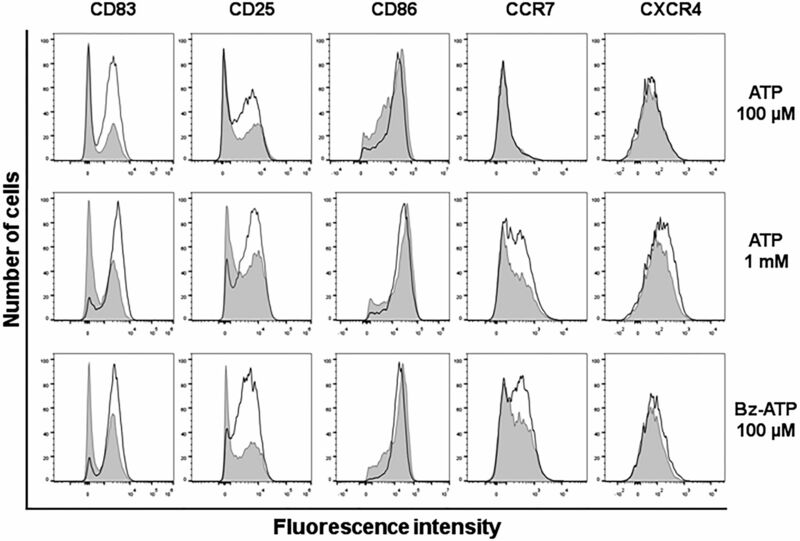 (B) Mean fluorescence intensities (MFI) of CD83, CD25, CD86, CCR7, and CXCR4 were normalized to those obtained from untreated DCs (n = 7 experiments from seven independent donors). (C) Expression of mRNA for P2X and P2Y receptors in DCs, assessed by RT-PCR. (D) Relative expression (MFI) of CD83 (n = 3–5) in DCs stimulated with nucleotides (1 mM ATP, 10 μM UTP, 10 μM ADP, 10 μM UDP) in the presence or not of the P2 antagonist suramin (100 μM), or stimulated by the hydrolysis-resistant analog BzATP (100 μM). (E) Relative expression (MFI) of CD83 in DCs stimulated with eATP (1 mM) in the presence (or not) of P2 antagonists PPADS (100 μM), TNP-ATP (30 μM), A438079 (10 μM), and NF340 (10 μM) (n = 3–5 independent experiments). Data represent means ± SEM. *p < 0.05, **p < 0.01, ***p < 0.001 differences from control condition (absence of ATP); ##p < 0.01, ###p < 0.001 compared with ATP condition. The type of cytokines produced by DCs is a key determinant of immune response polarization. Because eATP alone does not induce cytokine secretion but can modify the pattern of produced cytokines (32), we assessed the effect of P2Y11R inhibition on cytokine secretion in DCs under two experimental conditions: 1) LPS stimulation was used as a Th1-inducing factor, and 2) an inflammatory mixture (PGE2, IL-6, IL-1β, TNF-α) stimulation mimicking the cytokine microenvironment composition was used during an I/R episode (33, 34). Fig. 2 shows the role of P2Y11R on cytokine production by LPS-treated DCs. As shown in Fig. 2A, eATP (100 μM) significantly inhibited the release of the proinflammatory cyokine IL-12 under LPS stimulation (by 42.4 ± 9.9%). This effect was fully prevented by the P2Y11R antagonist NF340 (10 μM). In contrast, no effect of eATP was observed on the release of the anti-inflammatory cytokine IL-10, which remained high. Similar results were observed in presence of the inflammatory mixture (Supplemental Fig. 3). To confirm the role of P2Y11R in this effect, we used P2Y11R-specific siRNA (siP2Y11) and analyzed IL-12 and IL-10 productions. The efficiency of the siRNA directed against P2Y11 gene expression (siP2Y11) was assessed by Western blot (Fig. 2B). P2Y11R expression was decreased by ∼50% in siP2Y11-treated DCs compared with siCTL-treated cells. Targeting P2Y11R expression using siP2Y11 prevented the inhibition of IL-12 release by eATP (Fig. 2C). In control conditions (siCTL), eATP triggered a strong reduction of IL-12 production by DCs (52.2 ± 5.7%). Comparatively, in siP2Y11 DCs, eATP only induced a 21.9 ± 4.8% reduction of IL-12 production. The strikingly modified DC cytokine response to maturating factors in the presence of eATP prompted us to investigate their role on CD4+ T cell polarization during an allogeneic MLR. eATP-pretreated DCs were found to be potent inducers of T cell–dependent IL-4 production (2.92 ± 0.33-fold; Fig. 2D), compared with untreated counterparts in The presence of LPS. Moreover, these cells exerted a suppressive effect on IFN-γ secretion by T cells (83.1 ± 1.4% inhibition), compared with CTL DCs. P2Y11R mediates eATP ability to polarize LPS-treated DCs toward Th2. (A) Inhibition of IL-12 production by eATP is mediated by the P2Y11R, although IL-10 release was unchanged. Immature DCs were stimulated with LPS with or without eATP (100 μM) in the presence or absence of NF340 (10 μM). After 48 h of culture, IL-12 and IL-10 concentrations were measured in supernatants by ELISA. Results are given as means ± SEM of four independent experiments conducted on cells from four different donors. (B) Inhibition of P2Y11R expression in DCs cultured with a siRNA directed against P2Y11 mRNA, compared with siCTL-treated DCs. (C) IL-12 and IL-10 secretions assessed as in (A) in DCs cultured with siCTL or siP2Y11. Results are given as means ± SEM of three independent experiments conducted on cells from three different donors. (D) P2Y11R antagonist reverses Th2 polarization induced by eATP-treated DCs. IL-4 and IFN-γ concentrations in the supernatants of DCs cocultured with CD4+ T cells are shown. DCs were cultured as mentioned above and then washed twice before being cocultured with allogeneic CD4+ T cells. Cytokines release was analyzed after 6 d of coculture (n = 2 independent experiments). *p < 0.05, **p < 0.01, ***p < 0.001; ##p < 0.01 compared with ATP condition. We studied the effect of eATP stimulation on DCs subjected to 1 and 5 h of hypoxia, in absence of nutrients, followed by 48 h of reoxygenation. Expression of maturation and migration markers was analyzed 48 h after reoxygenation (Fig. 3). CTL DCs displayed a mature phenotype (CD83+, CD25+, CD86+) upon both eATP (100 μM, 1 mM) and BzATP (100 μM) stimulation, similar to that described in Fig. 1A. We observed that episodes of 5 h of H/R induced a decrease in the expression of CD83, CD25, and CCR7. In comparison, much smaller effects were observed on both CD86 and CXCR4 expression levels. CD83 expression decrease was dependent on hypoxia duration (Fig. 4, top). Indeed, it was decreased by 10.2 and 23.4% for 1 and 5 h of hypoxia, respectively. Likewise, CD25 expression was also time-dependently inhibited by 3.6 and 31.5% for 1 and 5 h of hypoxia, respectively (Fig. 4, middle). In contrast, no effect of hypoxia was observed on CD86 expression (Fig. 4, bottom). When P2Y11R was inhibited, using NF340, we observed a significant decrease in CD83 expression in CTL and 1-h H/R DCs, by 42.0 and 32.9%, respectively. In contrast, in 5-h H/R DCs, NF340 induced a non–statistically significant 16.7% reduction of CD83 expression. In the presence of NF340, CD83 levels were similar in CTL and H/R DCs. These data suggested that only NF340-sensitive maturation was inhibited during hypoxia with a greater effect observed after prolonged (5 h) compared with short (1 h) hypoxia duration. Comparable effects were observed for CD25 surface marker. Because it seems that the H/R sequence inhibits P2Y11R activity, we analyzed cytokine secretions by DCs subjected to an H/R episode. IL-6 could not be assessed in cells stimulated by the inflammatory mixture, because the mixture already contains IL-6. In presence of LPS, eATP induced a decrease in IL-12 production in 1-h H/R DCs. This reduction was abolished in the presence of NF340 (Fig. 5A). In 5-h H/R DCs, eATP induced only a slight decrease in IL-12 secretion, which was not prevented by NF340. In comparison, IL-10 synthesis remained unaffected in DCs stimulated by eATP in either 1- or 5-h H/R sequences (Fig. 5B). Measurements of IL-6 secretion revealed a significant decrease in 1-h H/R DCs stimulated with eATP, which was partially prevented by NF340. Again, no effect of eATP was observed in DCs challenged by a 5-h H/R (Fig. 5C). Additionally, 5-h H/R DCs released significantly higher levels of IL-12 and IL-6 compared with 1-h H/R DCs upon eATP stimulation. Consistently, in MLR, CD4+ T cells cocultured with 5 h of HYP and eATP-pretreated DCs released higher levels of IFN-γ than did T cells cocultured with 1-h HYP DCs (Supplemental Fig. 4). Similar results were obtained in DCs treated with the inflammatory mixture (Fig. 5D, 5E). H/R DCs are resistant to eATP-induced maturation. Immature DCs were stressed by hypoxia (PBS with Ca2+/Mg2+; 1% O2) or left unstressed (RPMI 1640; 21% O2) during 5 h, then CTL (unfilled histograms) and H/R DCs (gray-filled histograms) were centrifuged and reperfused in culture medium in the presence of eATP (100 μM or 1 mM) or Bz-ATP (100 μM). After 48 h, CD83, CD25, CD86, CCR7, and CXCR4 markers were analyzed by flow cytometry. Results are representative of four to six independent experiments. H/R decreases P2Y11R-dependent maturation of DCs as a function of hypoxia duration. CD83, CD25, and CD86 levels in surface of CTL, 1-h H/R, and 5-h H/R DCs cultured during 48 h from the reoxygenation time point with eATP in the presence or absence of NF340. Values are expressed as the mean fluorescence intensity (MFI). Data are given as means ± SEM of four to six independent experiments. *p < 0.05, **p < 0.01, ***p < 0.001. Hypoxia leads to the loss of the P2Y11R-dependent immunomodulatory effect of eATP. (A–C) One-hour H/R (light gray) and 5-h H/R DCs (dark gray) were cultured with LPS at the onset of reoxygenation for 48 h in the presence or absence of eATP (100 μM) with or without NF340 (10 μM). After 48 h of culture, supernatants were collected and analyzed for IL-12 (A), IL-10 (B), and IL-6 (C) secretions. (D and E) Cytokine release by H/R DCs cultured with an inflammatory mixture. IL-12 (D) and IL-10 (E) secretions were measured. Results are from three to four independent experiments conducted on cells from three to four different donors. Data are given as means ± SEM was shown. *p < 0.05, **p < 0.01 compared with CTL condition; #p < 0.05, ##p < 0.01 compared with ATP condition. Because our data suggested a loss of P2Y11R function in human DCs during H/R, we assessed P2Y11R mRNA levels under hypoxic conditions. Fig. 6A indicated that hypoxic insult >1 h induced a reduction of P2Y11R mRNA expression with a maximum 2.28 ± 0.03- and 2.87 ± 0.11-fold reduction after 3 and 5 h of hypoxia, respectively. Western blot experiments confirmed P2Y11R protein downregulation in DCs subjected to 5 h of hypoxia (5-h HYP DCs) compared with CTL DCs (Fig. 6B, 6C). As P2Y11R can be coupled to both phosphatidylinositol/phospholipase C/protein kinase C and adenylyl cyclase/cAMP/protein kinase A pathways, we investigated the effect of hypoxia on both intracellular calcium and cAMP levels in response to eATP. Whereas in CTL DCs eATP stimulation (100 μM) induced an intracellular [Ca2+] increase that was prevented by NF340 (Fig. 6D, left), in 2-h HYP DCs, eATP produced a smaller increase in intracellular [Ca2+] (Fig. 6D, right). Similarly, cAMP levels were significantly increased upon eATP stimulation in CTL DCs and fully prevented by the use of NF340, whereas cAMP levels did not change in DCs subjected to a 5 h of HYP (Fig. 6E). Hypoxia induces P2Y11R downregulation. (A) Decrease of P2Y11 mRNA expression in DCs stressed by increasing time of hypoxic insult compared with control DCs (cultured in control condition for the same durations; n = 3–5). (B) P2Y11R expression was analyzed by Western blot from total protein after 1 and 5 h of hypoxia, compared with CTL conditions. A representative blot is shown. (C) Relative level of P2Y11R expression after hypoxia (n = 4 independent experiments). (D) Variations of intracellular calcium levels were measured in DCs using Fura-2 fluorescence. Hypoxia and NF340 effects (gray lines) were analyzed comparing with control condition (black lines). (E) Variations of intracellular cAMP levels in DCs stressed or unstressed by 5 h of hypoxia followed by reoxygenation (8 min) with or without eATP stimulation and in the presence or absence of NF340 (n = 3 independent experiments). Data are given as means ± SEM. *p < 0.05, **p < 0.01 differences from control condition (CTL/−); #p < 0.05 comparison with ATP condition. To determine the molecular mechanisms underlying hypoxia-induced P2Y11R mRNA downregulation, we first confirmed HIF-1α stabilization under hypoxic conditions (Fig. 7A). Then, we examined the sequence of the P2RY11 gene for matches to the consensus HIF-1 binding sites (5′-RCGTG-3′; Fig. 7B). We identified seven putative HREs in the P2RY11 gene sequence, either in plus (+) and minus (−) strands, which included positions −1857 (+/−), −1704 (+/−), −419 (−), −149 (+), and −9 (−) bp relative to the start codon site. Then, we tried to identify whether the HIF-1α was responsible for P2Y11R downregulation during hypoxia. The use of a specific siRNA targeting HIF-1α mRNA (siHIF-1α) reduced the expression of HIF-1α by ∼70%, compared with a null-target siRNA (siCTL) in 5-h HYP DCs (Fig. 7B, 7C). Under these conditions, siHIF-1α strongly increased P2Y11R mRNA levels (2.48 ± 0.56-fold) in DCs, compared with siCTL-transfected counterparts. HIF-1α mediates human DC P2Y11R expression during hypoxia. (A) HIF-1α stabilization during 5 h of hypoxia. (B) Sequences and orientations of the putative HREs within the P2RY11 5′ genomic fraction corresponding to −2195/+5 relative to the start codon (bold ATG) and mentioning the transcription start site (TSS). The HRE motifs are in boldface type and underlined by arrows to indicate the plus (right arrows) and minus (left arrows) DNA strand. (C) HIF-1α mRNA expression in 5-h HYP DCs transfected with siRNA directed against HIF-1α RNA transcripts (siHIF-1α) or scramble siRNA control (siCTL). (D) Relative expression of P2Y11R mRNA in 5-h HYP DCs transfected with siHIF-1α compared with siCTL. Data are given as means ± SEM of three independent experiments using cells from three independent donors. *p < 0.05 difference from control condition (siCTL). Under physiological conditions, pericellular ATP concentration is kept in the nanomolar range (1–100 nM). During tissue damage, such as I/R injury, eATP levels can be elevated up to micromolar concentrations (2, 35). In these conditions, eATP acts as a danger signal and participates in immune system activation. It was previously shown that activating P2Rs by eATP upregulates maturation markers in DCs and triggers a shift in cytokine production upon either LPS or CD40L stimulation (19, 32). In this study, we showed that eATP induced a dose-dependent increase of CD83, CD25, CD86, CCR7, and CXCR4. Such an effect of eATP was previously observed on CD83 and CD86, and the authors envisioned a role for a P2X ionotropic receptor (19). However, because of the lack of selective P2R antagonists until recent years, the receptor involved in such effects was not clearly identified. In the present study, we demonstrated that P2Y11R was involved in the eATP-mediated DC maturation. We next analyzed cytokine production in the presence of LPS and found that P2Y11R drove the eATP-dependent decrease of IL-12 production without affecting that of IL-10 in human DCs. These effects were associated with a decrease of IFN-γ and increase of IL-4 production during the MLR. Taken together, these results suggest a P2Y11R-mediated inhibition of Th1 and promotion of Th2 response. Our results are consistent with previous studies showing an eATP-mediated inhibition of IL-12 production in activated DCs. However, in these studies, the P2Rs involved in this effect were not identified (18, 21). Our results indicate that the anti-inflammatory effect of eATP was exclusively mediated by P2Y11R, because P2Y11R inhibition by the selective antagonist NF340 restored the ability of LPS-activated DCs to polarize the immune response toward Th1. During I/R, release of DAMPs, such as eATP (17) and endogenous TLR ligands (7), by stressed cells triggers the recruitment and activation of immune cells (36). These immune processes participate in wound healing but may also be harmful to organ function, and proinflammatory cytokines are involved in the post-I/R sequence injuries (33, 37, 38). Although increasing evidence indicates that DCs likely play a key role during and after I/R (8, 39, 40), their specific role remains to be further explored. Some authors showed that DCs might be either protective (16) or detrimental (9, 41) for the reperfused myocardium. Indeed, studies performed in vivo show an increase of both eATP and inflammatory cytokines at the site of injury during I/R. In contrast, in vitro, we and others (19, 32) found that eATP induced a decrease of proinflammatory cytokines under normoxic conditions, and we show that this effect was mediated by the P2Y11R in DCs. To better account for these apparently paradoxical results, we hypothesized that the H/R sequence could modify the P2Y11R functions in human DCs. In the present study, we used an H/R model in which cells were deprived in oxygen and nutrients to investigate how H/R regulates P2Y11R activity. Furthermore, we used either LPS or an inflammatory mixture to identify the immunosuppressive role of P2Y11R in two different modes of DC activation. LPS was used as an activator of the TLR4 signaling pathway, promoting Th1 polarization, whereas the inflammatory mixture containing cytokines (PGE2, IL-6, IL-1β, and TNF-α) that are released during an IR sequence (33, 34) triggered cytokine-associated pathways. In these two different conditions, P2Y11R was demonstrated to fulfill the immunosuppressive effects of eATP. We assessed the effect of eATP–P2Y11R interaction on IL-12 and IL-6 secretion because both cytokines establish an inflammatory environment that may favor adverse outcomes. Indeed, the Th1-polarizing cytokine IL-12 is highly associated with acute allograft rejection (42, 43). Additionally, IL-6 has been shown to play a key role in acute inflammatory response (44) and in early injuries following allograft in transplantation models (45, 46). Interestingly, whereas in 1-h H/R DCs, eATP decreased IL-12 and IL-6 production by these cells, in 5-h H/R DCs this effect was completely lost. We even observed a slight induction of IL-12 by eATP in DCs activated by the inflammatory mixture. Consequently, DCs stressed by 5 h of hypoxia released higher levels of IL-12 and IL-6 when stimulated by eATP. After short hypoxia, eATP had anti-inflammatory effects that were lost after prolonged hypoxia. These results were supported by analysis of IFN-γ concentrations in supernatants of MLRs. T cells exhibited an inflammatory phenotype when cocultured with eATP-stimulated DCs that have been subjected to 5 h of hypoxia. We show, to our knowledge for the first time, that this biphasic effect of eATP was mainly due to the P2Y11R downregulation. We showed a time-dependent inhibition of P2Y11R expression at both mRNA and protein levels, associated with a strong decrease of P2Y11R activity, as shown by intracellular calcium and cAMP measurements. This downregulation of P2Y11R might partially account for the correlation between ischemia duration and graft injuries following transplantation (47, 48). During I/R, hypoxia, but also nutrient starvation, triggers injuries, as it might happen in our H/R model, which combines hypoxia and nutrient deprivation. It has been previously shown that glucose starvation can modulate DC functions (49). As such, we cannot exclude that the observed effects are partially mediated by nutrient starvation. Finally, in our H/R model, we showed, to our knowledge for the first time, that HIF-1α can inhibit P2Y11R transcription. HIF-1α is known to be induced by hypoxia and to upregulate several target genes involved in maintaining biological homeostasis (50). Additionally, HIF-1α has been implicated in downregulation of several genes that may involve the HIF-1α/Myc pathway (51). Several studies reported that HIF-1α can directly repress gene transcription by binding to response elements present within the gene promoters (52–54). In this study, we have shown that HIF-1α regulates P2Y11 mRNA expression in human DCs during hypoxia. However, although there are seven potential HREs in the promoter of P2RY11 gene, we cannot exclude an indirect transcriptional regulation. Nevertheless, HIF-1α–dependent downregulation of P2Y11R in human DCs may play a deleterious role in I/R injury following organ transplantation. In conclusion, our results suggest that DCs P2Y11R could play a pivotal role in mediating the inflammatory response following I/R. Of interest, some authors reported a protective role of P2Y11R stimulation in myocardial I/R (55, 56). These data combined with our observations support the idea that using pharmacological P2Y11R agonists during I/R episode could provide beneficial effects after organ transplantation and acute myocardial infarction. We thank A. Héraud and A. Sylvain for technical and administrative assistance, respectively. We also thank the Etablissement Français du Sang du Centre Atlantique of Tours for providing blood samples from healthy donors. This work was supported by grants from the Fédération Française de Cardiologie and the Agence de la Biomédecine.
. 2007. Inside, outside, upside down: damage-associated molecular-pattern molecules (DAMPs) and redox. Trends Immunol. 28: 429–436.
. 2010. Extracellular ATP is a danger signal activating P2X7 receptor in lung inflammation and fibrosis. Am. J. Respir. Crit. Care Med. 182: 774–783.
. 2006. ATP release guides neutrophil chemotaxis via P2Y2 and A3 receptors. Science 314: 1792–1795.
. 2010. ATP secreted by endothelial cells blocks CX3CL1-elicited natural killer cell chemotaxis and cytotoxicity via P2Y11 receptor activation. Blood 116: 4492–4500.
. 2006. Pannexin-1 mediates large pore formation and interleukin-1β release by the ATP-gated P2X7 receptor. EMBO J. 25: 5071–5082.
. 2010. Pathogenesis of myocardial ischemia-reperfusion injury and rationale for therapy. Am. J. Cardiol. 106: 360–368.
. 2011. Ischemia and reperfusion—from mechanism to translation. Nat. Med. 17: 1391–1401.
. 2007. Resident dendritic cells are the predominant TNF-secreting cell in early renal ischemia-reperfusion injury. Kidney Int. 71: 619–628.
. 2009. Survival and cardiac remodeling after myocardial infarction are critically dependent on the host innate immune interleukin-1 receptor-associated kinase-4 signaling: a regulator of bone marrow-derived dendritic cells. Circulation 120: 1401–1414.
. 2011. Innate immune signaling in cardiac ischemia. Nat. Rev. Cardiol. 8: 292–300.
. 2007. Increasing numbers of hepatic dendritic cells promote HMGB1-mediated ischemia-reperfusion injury. J. Leukoc. Biol. 81: 119–128.
. 2012. Regulatory role of dendritic cells in postinfarction healing and left ventricular remodeling. Circulation 125: 1234–1245.
. 2006. Accumulation of extracellular ATP protects against acute reperfusion injury in rat heart endothelial cells. Cardiovasc. Res. 71: 764–773.
. 2012. P2 receptors and immunity. Microbes Infect. 14: 1254–1262.
. 2001. Extracellular ATP induces a distorted maturation of dendritic cells and inhibits their capacity to initiate Th1 responses. J. Immunol. 166: 1611–1617.
. 2005. 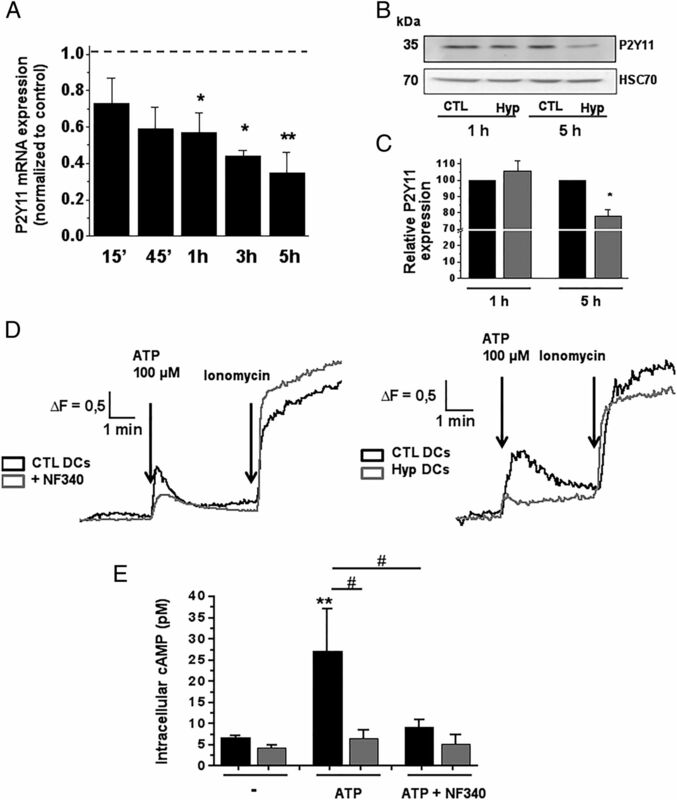 Thrombospondin-1 and indoleamine 2,3-dioxygenase are major targets of extracellular ATP in human dendritic cells. Blood 106: 3860–3866. 2005. Purinergic mechanism in the immune system: a signal of danger for dendritic cells. Purinergic Signal. 1: 205–209.
. 2000. Extracellular ATP and TNF-α synergize in the activation and maturation of human dendritic cells. J. Immunol. 165: 4704–4709.
. 2009. Necrotic cells trigger a sterile inflammatory response through the Nlrp3 inflammasome. Proc. Natl. Acad. Sci. USA 106: 20388–20393.
. 2011. P2X7 receptor activation enhances SK3 channels- and cystein cathepsin-dependent cancer cells invasiveness. Oncogene 30: 2108–2122.
. 2014. The activation of P2Y2 receptors increases MCF-7 breast cancer cells migration through the MEK-ERK1/2 signalling pathway. Carcinogenesis 35: 1238–1247.
. 1999. Pharmacological characterization of recombinant human and rat P2X receptor subtypes. Eur. J. Pharmacol. 376: 127–138.
. 2012. P2X4R+ microglia drive neuropathic pain. Nat. Neurosci. 15: 1068–1073. 2007. Liaisons dangereuses: P2X7 and the inflammasome. Trends Pharmacol. Sci. 28: 465–472.
. 2011. Common variants in P2RY11 are associated with narcolepsy. Nat. Genet. 43: 66–71.
. 2013. High glucose concentration impairs ATP outflow and immunoglobulin production by human peripheral B lymphocytes: involvement of P2X7 receptor. Immunobiology 218: 591–601.
. 2002. Extracellular adenine nucleotides modulate cytokine production by human monocyte-derived dendritic cells: dual effect on IL-12 and stimulation of IL-10. Eur. J. Immunol. 32: 2409–2417.
. 2004. Inflammatory cytokines and postmyocardial infarction remodeling. Circ. Res. 94: 1543–1553.
. 2014. PI3Kδ inhibition reduces TNF secretion and neuroinflammation in a mouse cerebral stroke model. Nat. Commun. 5: 3450.
. 1999. Detection of local ATP release from activated platelets using cell surface-attached firefly luciferase. Am. J. Physiol. 276: C267–C278.
. 2010. Hypoxia modulates phenotype, inflammatory response, and leishmanial infection of human dendritic cells. APMIS 118: 108–114.
. 2011. Inflammasome activation of cardiac fibroblasts is essential for myocardial ischemia/reperfusion injury. Circulation 123: 594–604. 2012. Immune cell modulation of cardiac remodeling. Circulation 125: 1597–1600.
. 2013. Temporal dynamics of cardiac immune cell accumulation following acute myocardial infarction. J. Mol. Cell. Cardiol. 62: 24–35.
. 2008. Differential effects of GM-CSF and G-CSF on infiltration of dendritic cells during early left ventricular remodeling after myocardial infarction. J. Immunol. 181: 5691–5701. 1991. Cells mediating allograft rejection. Transplantation 51: 1141–1151.
. 2003. Pre-transplant Th1 and post-transplant Th2 cytokine patterns are associated with early acute rejection in renal transplant recipients. Clin. Transplant. 17: 151–157.
. 2000. Interleukin-6 signal transduction and lymphocyte function. Immunobiology 202: 151–167.
. 2007. Graft produced interleukin-6 functions as a danger signal and promotes rejection after transplantation. Transplantation 84: 771–777.
. 2009. Early renal ischemia-reperfusion injury in humans is dominated by IL-6 release from the allograft. Am. J. Transplant. 9: 1574–1584.
. 2000. Dynamic changes in apoptotic and necrotic cell death correlate with severity of ischemia-reperfusion injury in lung transplantation. Am. J. Respir. Crit. Care Med. 162: 1932–1939.
. 2011. Total donor ischemic time: relationship to early hemodynamics and intensive care morbidity in pediatric cardiac transplant recipients. Pediatr. Crit. Care Med. 12: 660–666.
. 2014. Metabolic regulation of immune responses. Annu. Rev. Immunol. 32: 609–634.
. 2009. HIF at a glance. J. Cell Sci. 122: 1055–1057.
. 2004. Dynamic balancing of the dual nature of HIF-1α for cell survival. Cell Cycle 3: 853–854.
. 2007. Identification of vasodilator-stimulated phosphoprotein (VASP) as an HIF-regulated tissue permeability factor during hypoxia. FASEB J. 21: 2613–2621.
. 2009. 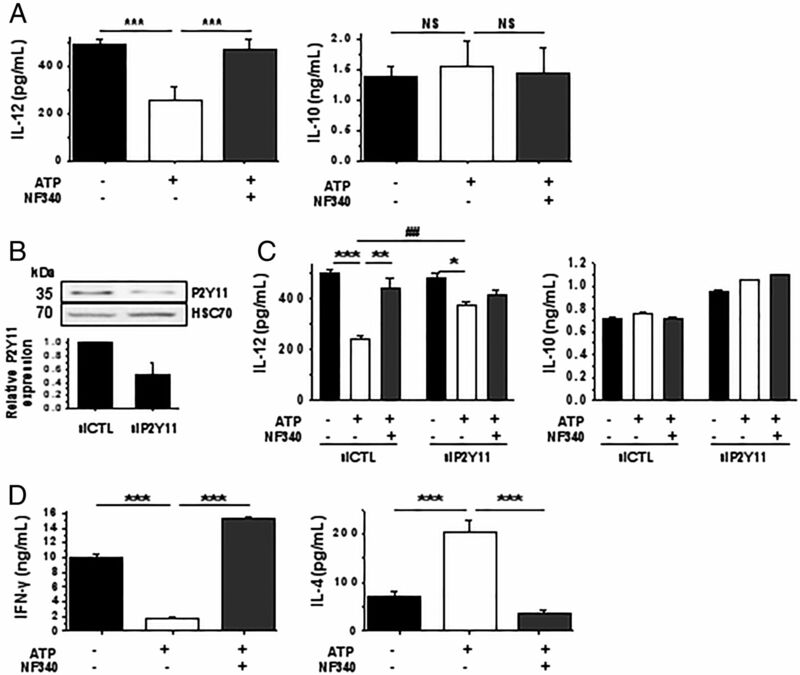 Hypoxia inducible factor-1 (HIF-1)-mediated repression of cystic fibrosis transmembrane conductance regulator (CFTR) in the intestinal epithelium. FASEB J. 23: 204–213.
. 2011. Hypoxia and HIF-1 suppress SERCA2a expression in embryonic cardiac myocytes through two interdependent hypoxia response elements. J. Mol. Cell. Cardiol. 50: 1008–1016.
. 2005. Phospholipase C and cAMP-dependent positive inotropic effects of ATP in mouse cardiomyocytes via P2Y11-like receptors. J. Mol. Cell. Cardiol. 39: 223–230.
. 2013. Extracellular NAADP affords cardioprotection against ischemia and reperfusion injury and involves the P2Y11-like receptor. Biochem. Biophys. Res. Commun. 434: 428–433.